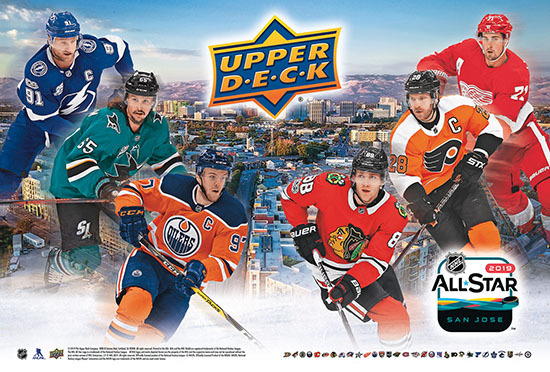 When it comes to fan engagement, nobody takes their customers behind the curtain like Upper Deck. 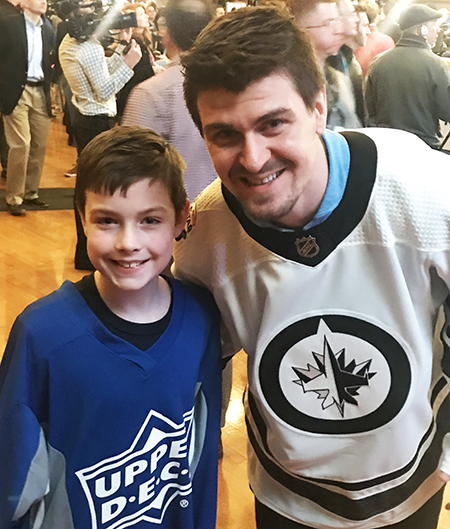 Most recently nine-year-old Nick Corbett of Minnesota was able to enjoy a once-in-a-lifetime experience from Upper Deck. 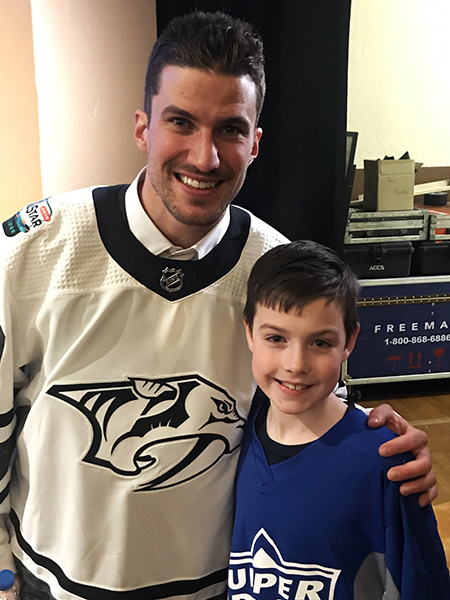 Nick is a passionate hockey fan and he enjoys cheering for the team his dad grew up with; the Calgary Flames. 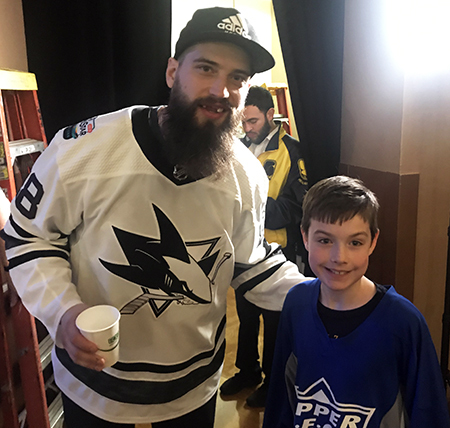 For the last couple years, Nick has been asking his dad Matt if he could take him to the NHL® All-Star Game. 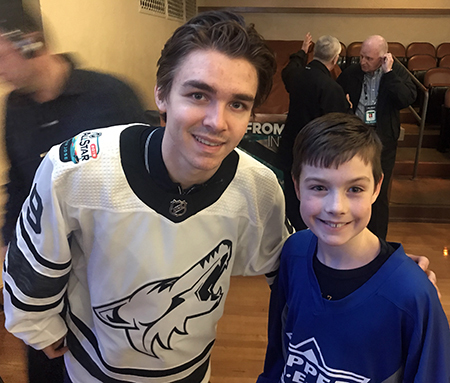 This year the Corbett family surprised Nick with tickets at Christmas knowing he would love the game and it was also a great excuse to escape the cold of Minnesota. 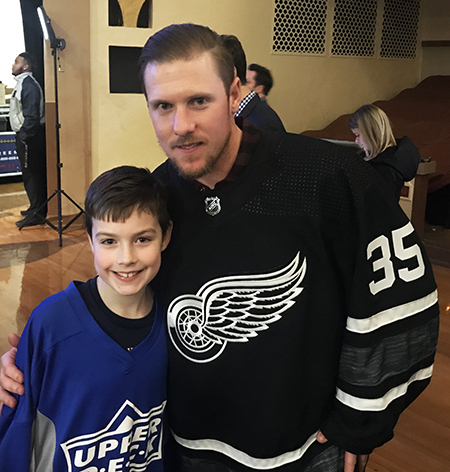 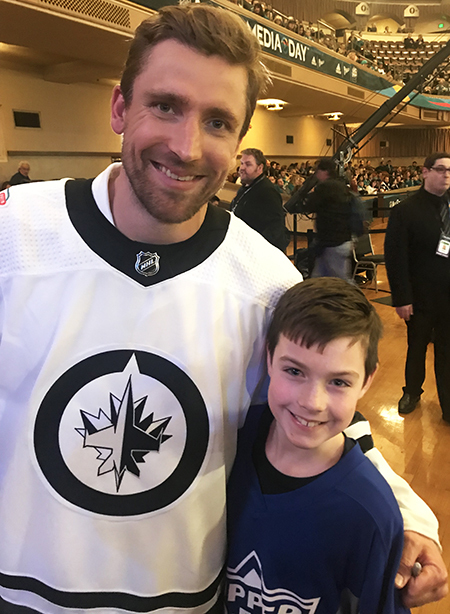 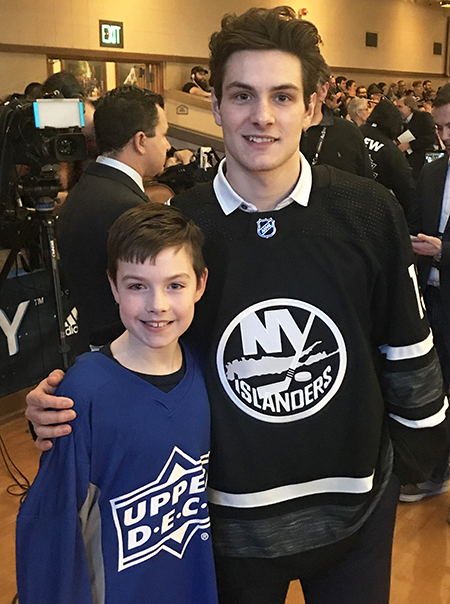 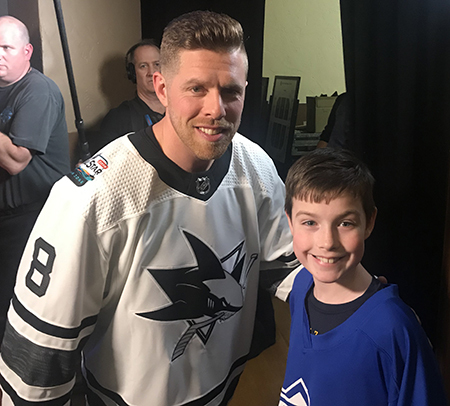 Matt hooked up with Upper Deck and we wanted to work to make Nick’s first NHL® All-Star experience one to remember by making him the Upper Deck Kid Correspondent at Media Day. 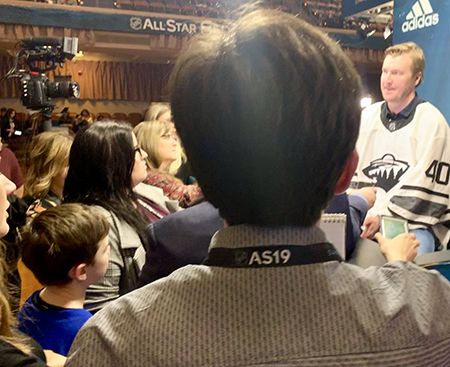 Nick’s dad and Upper Deck staff gave Nick a crash course in media training talking to him about speaking loudly for the athlete to hear his questions, not being afraid to work his way up to the front of the podium and to have a couple questions prepared. 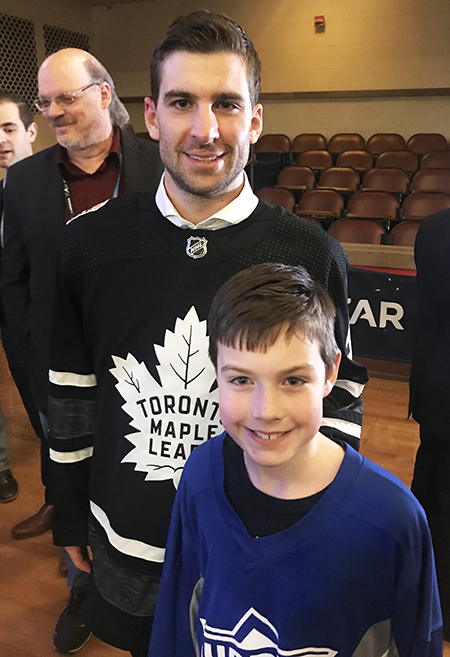 Escorted by staff from Upper Deck, the NHL and of course his father, Nick was ready. 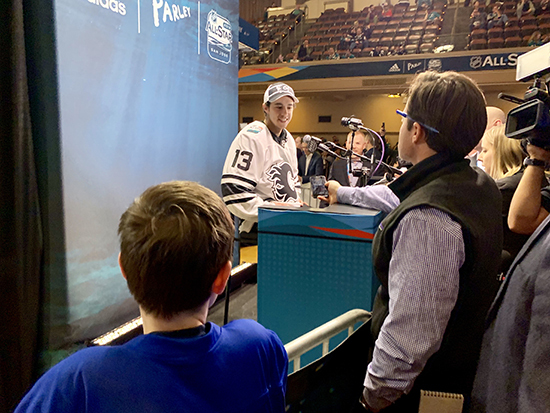 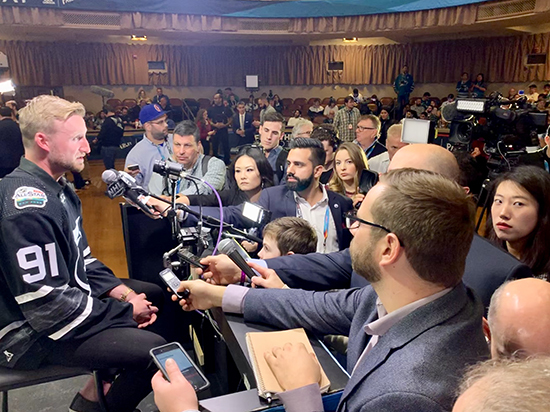 At the 2019 NHL® Media Day athletes are brought out by division and they take a spot at one of eight different podiums in a large auditorium. 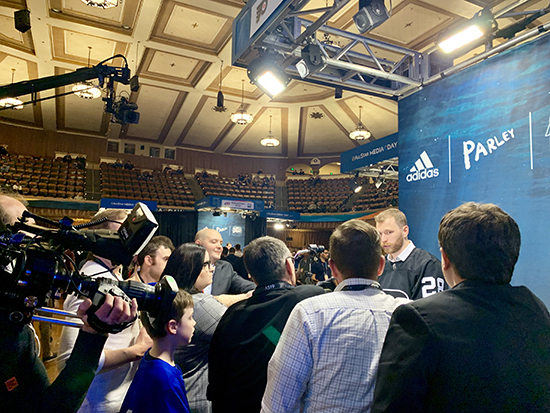 Members of the media scamper from podium to podium hoping to get “gold” from the players that they can use to lead evening sports news with. 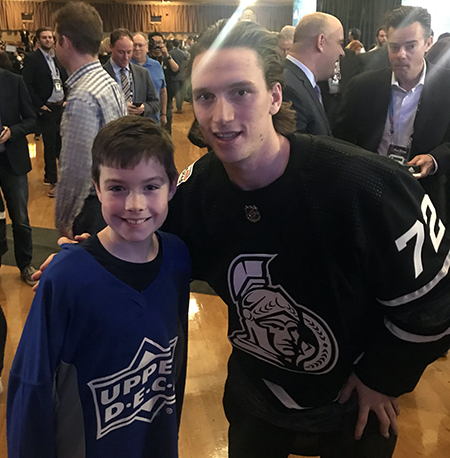 The NHL brought out the big guns in terms of showcasing the top talent in the game at Media Day and Nick pretty much met them all! 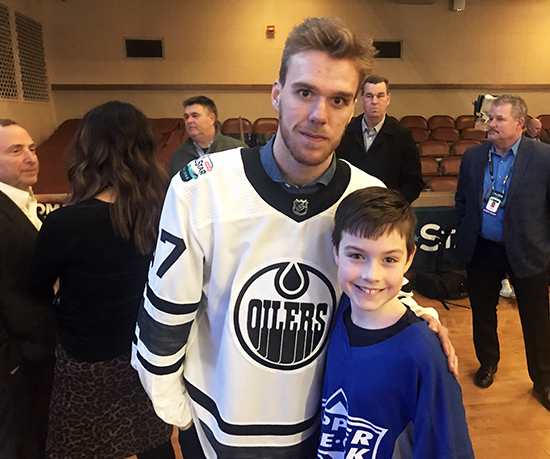 Connor McDavid with the NHL Commish in the background! 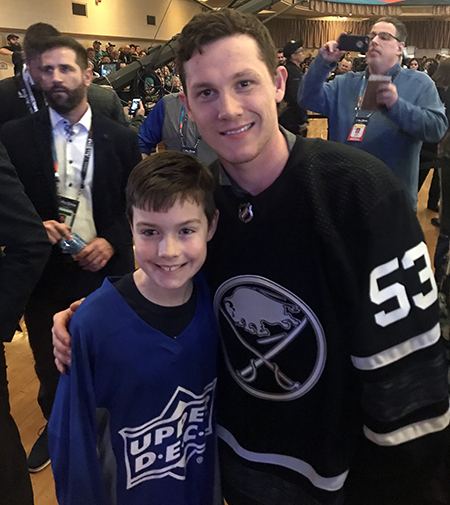 Nick’s dad shares some tips with his son as he gets up close and personal with the NHL’s best. 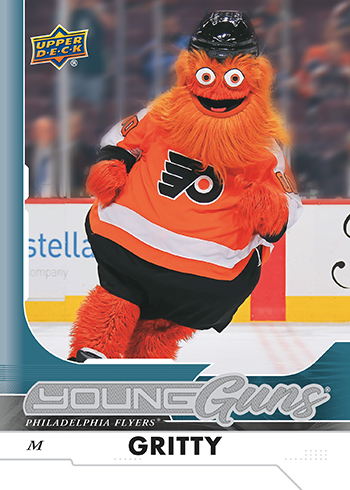 To Claude Giroux, “What’s it been like to have the best free-agent pick-up ever with the addition of Gritty?” Giroux shared how freakishly intense the orange beast is on and off the ice. 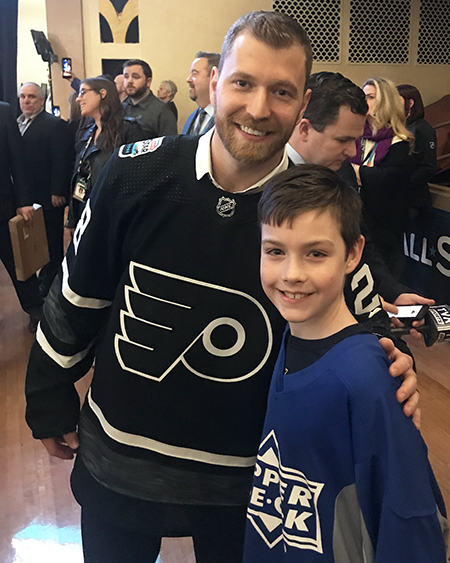 Nick is a student of the game and like the dynamic teammates bring to the game. 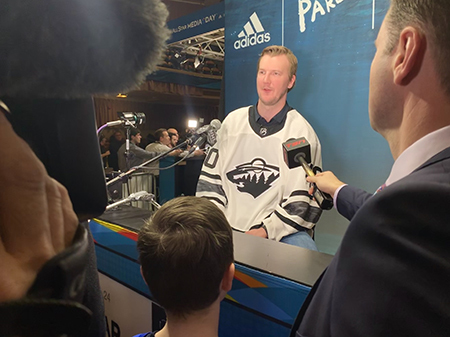 He asked Devan Dubnyk about playing with Zach Parise and asked Johnny Gaudreau about playing with Elias Lindholm. 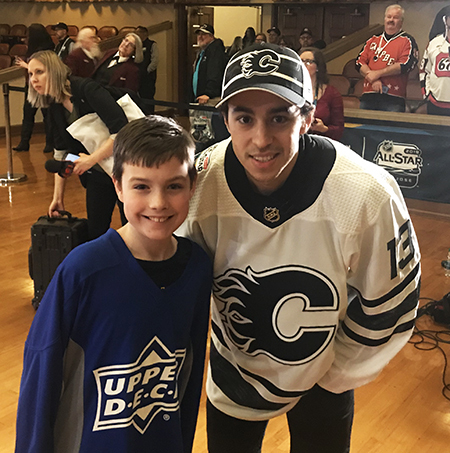 Gaudreau really hit it off with young Nick! 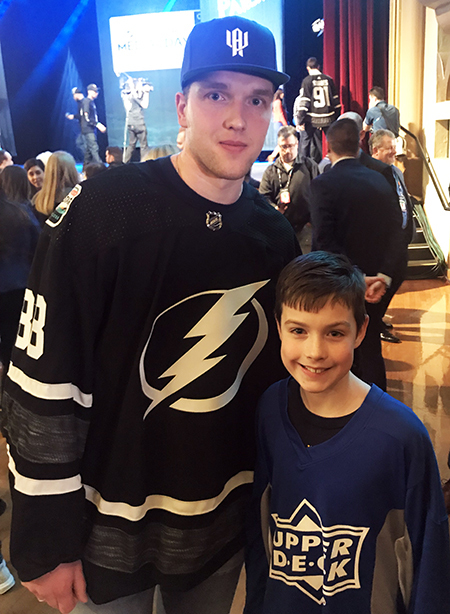 And he may have asked Steven Stamkos where he got his awesome haircut. 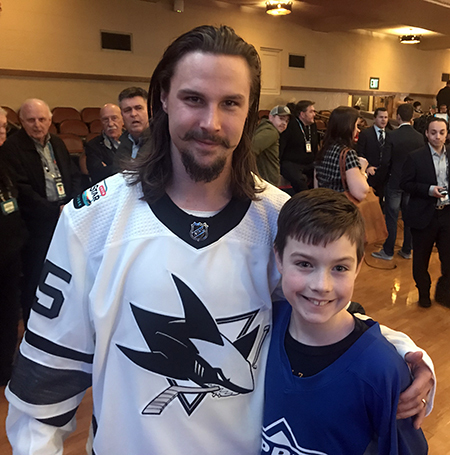 What was the experience like? 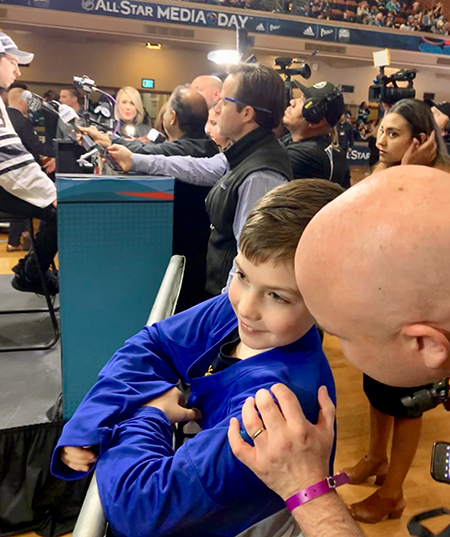 Check out Nick and Matt’s thoughts when the dust settled and the 2019 NHL® All-Star Media Day was finished! 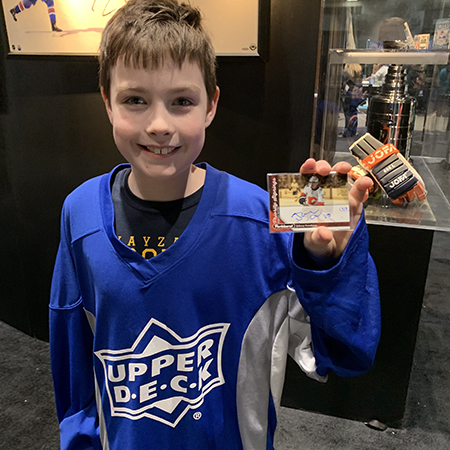 We firmly believe collecting Upper Deck NHL® cards is a family affair so to bring the trading cards to life for this father & son team was extremely special and created moments that will last a lifetime. 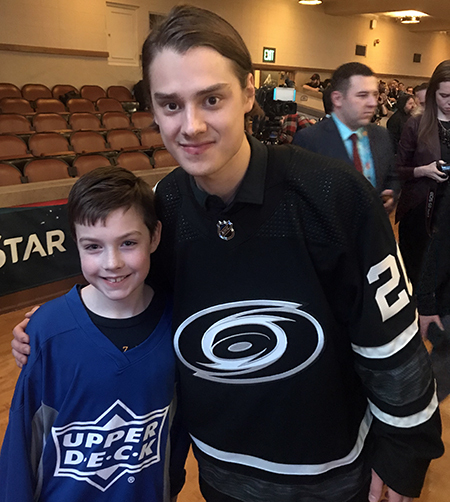 To help provide Nick with a tangible keepsake to help remember this event Upper Deck provided him with a variety of collectibles including his new favorite hockey card; a limited-edition Johnny Gaudreau autograph card! 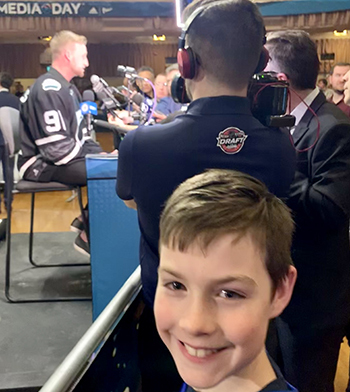 He was all smiles and likely will be for the next few days.